It was a punkin’ chunkin’ Spookmoot Sunday! In case you happened to miss it – too bad for you – it was a punkin’ chunkin’ Spookmoot Sunday the day after Halloween! And we didn’t let a little drizzly rain stop us from Waynesville’s first (so far as we know) punkin’ chunkin competition and general smashed (sometimes rolled) punkins down the hill on Miller Street from Main Street. Folkmoot partnered with Western Carolina University for a quality punkin’ chunkin’ experience! 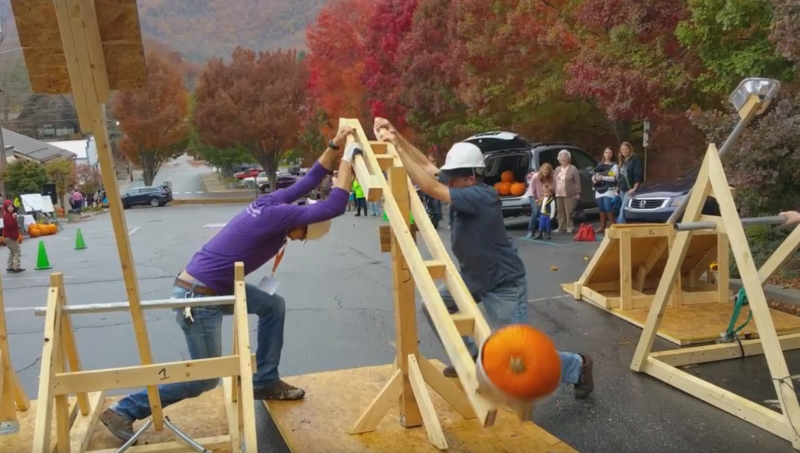 Students from WCU’s Construction Management Department designed and built four catapults for this inaugural Punkin’ Catapult with the Catamounts! And the students teamed up in groups of four to challenge themselves and the good people of Haywood County and all of Western Carolina to beat their best chunkin’. The catapults were created out of all sorts of things: wood, piping, bungie cords and even colanders!